Robert Trent Jones designed this solid course about 45 minutes from the city. 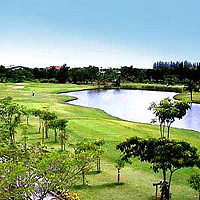 The course seems to missing character but remains popular with locals as part of the Green Valley group. Opulent houses line the fairways and if they spent some money on the golf course it could be one of Bangkok's best. Very popular with locals, the course lacks any real sting or memorable holes, but an enjoyable round nevertheless. If you've played all of Bangkok's more famous courses, Green Valley would be a good next choice and probably won't disappoint. A little overpriced and the club lacks any character or special qualities although overall no complaints.